All-Natural Citrus, Up to 40-50 sprays per refill. 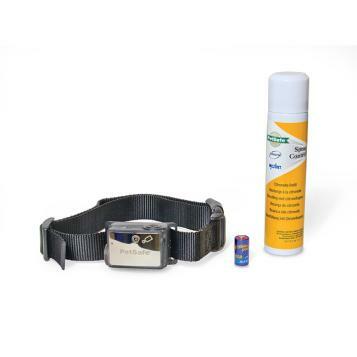 The PetSafe Big Dog Citronella Spray Bark Control Collar is simple to use and very effective. The PetSafe Big Dog Citronella Bark Collar deters excessive barking with a startling burst of citronella spray. When your dog barks, a burst of citronella-scented spray is emitted, which dogs find bothersome to their highly developed sense of smell. While not harmful, this spray bark collar has a sufficient stimulus to deter excessive barking.